Minneapolis and St. Paul are known as the twin cities. Minneapolis is the larger of the two cities, lying on both banks of the Mississippi river just north of where the river joins with the Minnesota river. St. Paul, on the other hand, lies primarily on the east bank of the Mississippi river, adjoining Minneapolis. 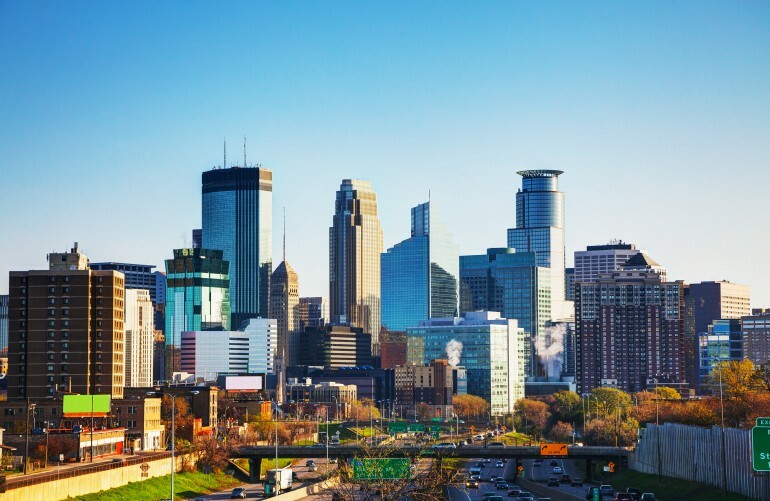 These twin cities are located in the State of Minnesota, which is known as the land of 10,000 lakes – Minneapolis itself has 13 lakes and numerous creeks and waterfalls. While St. Paul is the smaller of the two cities, it is the state capital. These two cities represent the largest business center between Seattle and Chicago. Minneapolis has the fifth largest concentration of Fortune 500 cities in the United States. Target, a major retailer is headquartered here. Minneapolis-St. Paul offers ever expanding business opportunities, which in turn means a growing and increasingly diverse population. Other economic activities include manufacturing, data centers, animal science and bioscience – the world-renowned Mayo Clinic is headquartered here and serves as major hub for the biosciences and for medical innovation/health care. As a major crossroads, there is a strong presence of rail and trucking services. With the many lakes in the state and the professional sports of basketball, baseball, ice hockey and football located in the twin cities, and the other attractions on offer, tourism is a significant contributor to the local economy. Commerce and financial firms/banks also play a role, as do the fact that the Federal Reserve Bank and the Minnesota Grain Exchange all of which are located here. As can be expected, with this amount of variety and diversity in the economy, there is an existing and consistently growing demand for first class translation services, be they document or video related. World Translation Center has more than a decade of experience and high level of expertise in partnering with its clients, providing reliable and accurate translation services. Documents of all kinds, be they software related, technical, financial, medical or marketing materials, including videos, demand the attention of competent translators. World Translation Center provides translation and voice recording services for over 150 languages. We offer one of largest voice over databases with over 2,500 demos of professional native speakers from over 150 countries. World Translation Center has extensive experience in translation and/or interpretation of virtually any language pair. Our team will work closely with you to execute your project accurately and professionally.